In the Malay language, orang-utan means “man of the forest.” Washington University scientists led an international project to sequence the orangutan genome. The work is expected to aid conservation efforts and the study of human evolution. Among great apes, orangutans are humans’ most distant cousins. 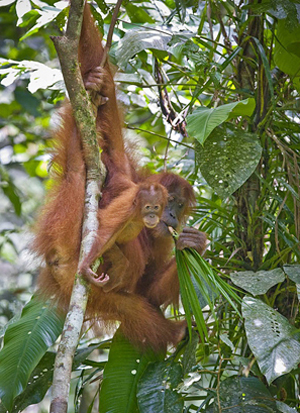 These tree dwellers sport a coat of fine reddish hair and have long been endangered in their native habitats in the rainforests of Sumatra and Borneo in Southeast Asia. Now, an international team of scientists, led by Washington University School of Medicine in St. Louis, has decoded, or sequenced, the DNA of a Sumatran orangutan. With this genome as a reference, the scientists then sequenced the genomes of five additional Sumatran and five Bornean orangutans. Their research, published Jan. 27 in Nature, reveals intriguing clues about the evolution of great apes, including humans, and showcases the immense genetic diversity across and within Sumatran and Bornean orangutans. Diversity is important because it enhances the ability of populations to stay healthy and adapt to changes in the environment. Orangutan genomes decoded Washington University scientists led an international project to sequence the orangutan genome. The research reveals intriguing clues about the evolution of great apes, including humans, and showcases the immense genetic diversity among orangutans, which are endangered due to the encroachment of humans in their native habitats in Borneo and Sumatra in Southeast Asia. Slow connection? Try our low bandwidth version. | Find more videos in the Video Newsroom. The scientists catalogued some 13 million DNA variations in the orangutans. This valuable resource can help conservationists assess the genetic diversity of orangutan populations both in the wild and in captivity and help set priorities for aiding subpopulations based on their genetic health. The orangutan genome adds detail to the evolutionary tree and gives scientists insights into the unique aspects of human DNA that set man apart from the great apes, their closest relatives. Overall, the researchers found that the human and orangutan genomes are 97 percent identical. A genome reads much like an instruction book for creating and sustaining a particular species. The chromosomes are the chapters and within every chapter are paragraphs, sentences, words and single letters, which are like the individual bases of the DNA sequence. One possible clue to the lack of structural rearrangement in orangutan DNA is a profound lack of repetitive “Alu” elements. These short stretches of DNA make up about 10 percent of the human genome and can pop up in unexpected places to create new mutations or genetic rearrangements. The human genome possesses about 5,000 human-specific Alus, while the chimp has about 2,000 chimp-specific Alus. The initial Sumatran orangutan genome was sequenced using legacy technology and cost $20 million to complete. Using more sophisticated technology, the cost of sequencing the additional orangutans dropped substantially to about $20,000 each. The project was funded by the National Human Genome Research Institute, the National Science Foundation and other organizations. The new research shows that the Sumatran and Bornean orangutans diverged some 400,000 years ago. Earlier estimates had put the split at about 1 million years ago. Today, only about 50,000 Bornean and 7,000 Sumatran orangutans still live in the wild. But in a finding that seems counterintuitive, the researchers found the smaller population of Sumatran orangutans is genetically more diverse than their Bornean cousins. Studies of orangutans are important because these great apes, in particular, are under intense ecological pressure. Their numbers continue to erode as humans encroach further on their habitat. The research was funded by the National Human Genome Research Institute with further support from the National Institutes of Health, National Science Foundation, David and Lucile Packard Foundation, Cornell University Provost’s Fellowship, United Kingdom Medical Research Council, Marie Curie Fellowship, Ministerio de Ciencia e Innovación-Spain (MCI-Spain) and Fundación M. Botín, MCI-Spain, Spanish National Institute for Bioinformatics (INAB) and the Fundação para a Ciência e a Tecnologia, PRIN and CEGBA, and the Commission of the European Communities. Locke DP, Weinstock GM, Rogers J, Mardis ER, Gibbs RA, Wilson RK. Comparative and demographic analysis of orang-utan genomes. Nature. Jan. 27, 2011.